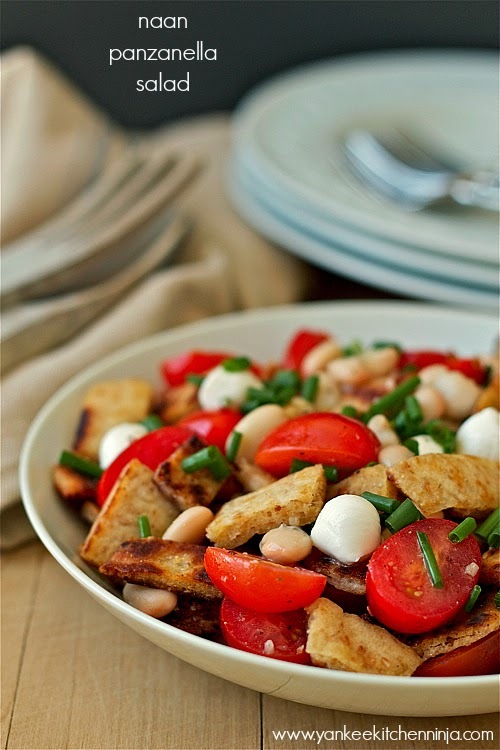 Enjoy this quick-to-prepare riff on rustic Italian panzanella salad, with lightly fried naan and a bright lemony dressing -- an easy summery meal salad, perfect for a weeknight dinner or hearty lunch. It's not quite summer yet, but I've been a summery meal salad kick lately. I love meal salads and am always looking for new ideas to make them interesting. Lately I've been throwing savory granola into my salads for a little extra crunch: highly recommended. 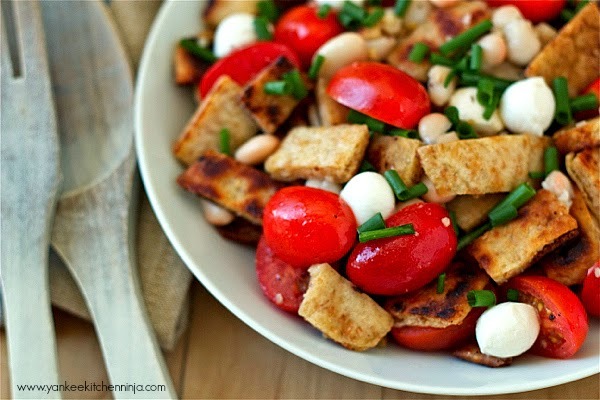 For this riff on my favorite summer salad, panzanella (Italian bread salad), I've kicked it up with lightly fried naan. I'm a naan junkie. I think the wait staff at my favorite Indian restaurant probably cringes when I arrive for the lunch buffet -- I bet they lose money that day based solely on the amount of naan that I manage to scarf down in one sitting. I need to try making naan at home, that's for sure (stay tuned). Until then, I'm a big fan of Stonefire Grill's packaged naan, because they use all-natural ingredients like whole grain flour, buttermilk and ghee, and no preservatives: booyah! Right in line with my stealthy homemaking mantra to not eat processed crap. One of my other favorite things about this easy-to-prepare naan panzanella is the simple dressing, made amazingly fresh and tasty with lemon-infused olive oil. It adds just the right amount of bright summery zing that you can really taste. I was recently turned on to the lemon olive oil from Calivirgin and it is ah-mazing! However, if you can't find any lemony olive oil, you can simply use regular olive oil and add a bit of freshly squeezed lemon juice to your dressing. Just please don't skip the lemon entirely -- you'll miss out on the brightness. 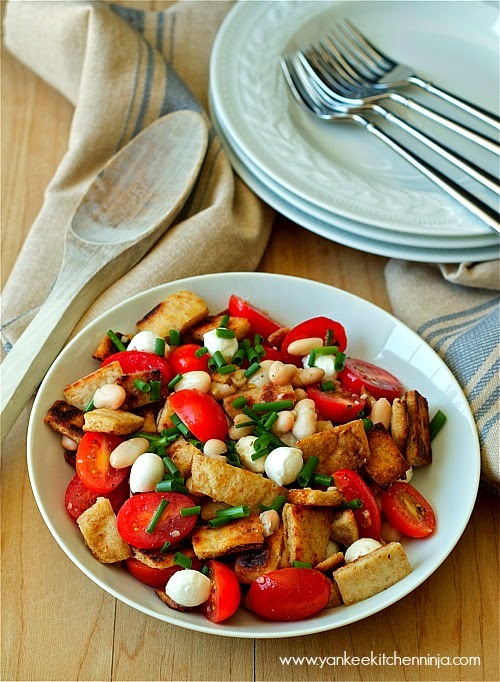 This naan panzanella is plenty filling and full of protein, as it is loaded with cannellini beans. But if you are a meatasaurus like me and prefer a less meatless option, feel free to add some grilled chicken breast. Are you a meal salad fan, too? Or even just a naan maniac? Leave a comment: The Ninj wants to know. Disclosure: While I have been given product samples in the past from both Stonefire Grill and Calivirgin, I did not develop this recipe for them, nor have they sponsored this post or compensated me in any way. Heck, they're not even aware I wrote it! All thoughts and opinions are my own and simply reflect how I cook and eat. If you're unable to locate any lemon-infused olive oil for the dressing, simply substitute 2 tablespoons plain olive oil and a squeeze of fresh lemon juice. Heat 1 tablespoon olive oil in a large skillet over medium-high heat. Add the naan and cook about 5 minutes or until lightly browned, stirring often. Meanwhile, in a large bowl, whisk together the vinegar, lemon oil, garlic and salt and pepper to taste. Add the tomatoes, cheese, beans, green onion and naan; toss to coat. Serves 3-4. I think you'll really like it with the naan, Chris -- and that olive oil is so freakin' good!! !